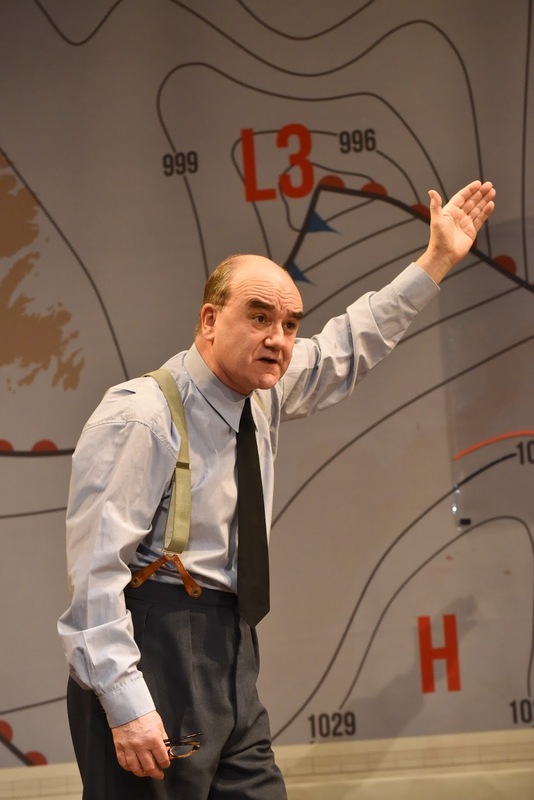 First seen in Edinburgh and Chichester in 2014, David Haig’s acclaimed Pressure finally arrives at London’s Park Theatre where it runs for a month or so before heading in to the West End for a well deserved transfer. Haig leads the cast too, in a magnificent performance as Group Captain James Stagg, the meteorologist responsible for forecasting the June 1944 weather in the days leading up to D-Day. Rarely is a drama so ingeniously titled. Not only is the audience on the edge of their seats as they learn the rudiments of isobars, millibars and anticyclones, the play also reflects the human pressures that pound the cast, much like the unseasonably fierce storm that Stagg predicted would hit the English Channel on June 4th and 5th and which led to, on his advice, the postponement of D-Day to the (now memorialised) date of June 6th. Haig’s scripts have already displayed an uncanny ability to depict the humanity in our history and he does it again here. Stagg is a dour Scot, principled and meticulous and beautifully contrasted with his US counterpart, Philip Cairns’ Colonel Krick. The Yank is a slickly greased all-American quarter-back who’s brash and arrogant and, every inch, ‘over here’. The contrast between Jock and jock could not be more pronounced. The dialogue is so sweetly crafted too. When Stagg is being pressed for his forecast he exclaims “I’m a scientist, not a gambler!” – a powerful comparison, only heightened by the stakes that surrounded the Normandy landings being nothing short of existential. Stagg’s personal pressures are compounded by a concern for his (off-stage) pregnant wife who faces a risky and complicated confinement, while he too is confined to his weather room by the War Office. But it is more than Stagg’s battles that make this such a stunning piece of writing. In close support of Haig are Malcolm Sinclair’s General Eisenhower and Laura Rogers’ Kay Summersby, the British adjutant assigned to Ike during his posting in Britain to plan Operation Overlord. Both Sinclair and Rogers created their roles back in 2014 and it shows. Where Stagg (before this play) was one of history’s unsung heroes, Eisenhower has long been famed as a legendary General - and Sinclair’s interpretation of the man is one of the finest supporting performances to be found. Together with Haig (and director John Dove) Sinclair unlocks the enigma of military greatness, showing not only the pragmatism and steely resolve required in a leader, but also a heart capable of the most profound compassion. When Eisenhower speaks of having quietly visited the 101st Airborne Division the night before the landings, to wish “his boys” good luck in the face of possible death, the emotion in his words is as tangible as it is sincere. Beautiful stuff. And then there’s Summersby who’s support and devotion for Eisenhower has clearly crossed the parameters of the military covenant, leading her to become the General’s lover and rarely is love defined so exquisitely (think perhaps of Celia Johnson in Brief Encounter). This pair’s passions may have been consummated, but Summersby’s devastation on being ruthlessly discarded by Ike, as he leaves Britain to continue his military campaign on the continent, is a work of magnificence from Rogers. Colin Richmond’s subtle yet brilliant set, all Bakelite phones and massive weather charts depicting the Atlantic storms, alongside Philip Pinsky’s sound design, serve perfectly to create the play’s time and place. There is something magical about Haig’s carefully researched script, with a text that could almost be a paean to the British climate. Stagg’s description of a typical summer’s day on a south coast beach, in which all four seasons can easily expect to be encountered, and which leaves the incredulous Krick dumbfounded, had the audience chuckling at its recognisable familiarity. Pressure is an unmissably beautiful piece of theatre.